Adopting my dog was a snap decision. It was Friday afternoon, just before Mother’s Day, when I checked online at the Humane Society for Southwest Washington. Several dogs were available, including a peculiar, little, red Dachshund with one blue and one brown eye. I had to meet him. I pushed and pushed, reassuring my fiancé, Jake, we were just going to look. It’s not like we were going to leave with a dog. The next day, we arrived at the shelter about 20 minutes early. A small crowd gathered around the locked doors. I thought, “Oh, no, what if someone is coming for the little Dachshund,” who I had already secretly named Bodhi (boh-dee), which means “enlightenment” in Buddhism. As soon as the doors opened at noon, we dashed inside and went straight back to the kennels, searching for him. We found him cowering in a puddle of his urine, clearly scared and confused. It only took one look. Jake knew this little guy was coming home with us. I asked him to stand guard as I hurried to the front desk to fill out the paperwork. Minutes later we had Bodhi, then known as Zoolander, in a meet-and-greet room. He was timid and distracted by the other dogs’ barking, but he seemed sweet enough. I loved him already. The next thing we knew, we were up at the front filling out all of his adoption paperwork and picking out a leash, collar, food bowls, toys — the works. The whole process took less than two hours. We loaded Bodhi into the car. He sat on Jake’s lap the whole way staring up at us with the most puzzled-but-happy look on his face. Bodhi checks out the sights and sounds of the Recycled Arts Festival at Esther Short Park from his stroller. That first week was great. He was quiet. He appeared to be housebroken. He walked well on the leash, and he got along with both of us. But ironically, as Bodhi became more comfortable, the problems emerged. In hindsight, I should have done my research. Owning a dog is a huge responsibility. Jake and I both had childhood dogs, so I thought, “How hard could it be?” Little did I know, Dachshunds are notorious for their stubborn behavior. They’re difficult to housebreak and train, in general. On top of that, Bodhi is an emotional basket case. He has an intense fear of men, particularly Jake. It’s the oddest thing. We can all be sitting on the couch or lying in bed, and Bodhi is perfectly fine. He snuggles up to Jake and obsessively licks him. But as soon as Jake is on his feet and moving, Bodhi heads for the hills, or more accurately, under the bed, under the end table, under my feet, next to the toilet, wedged in between the fridge and wall. The fear takes control. Jake has never done anything to warrant the behavior. In fact, as time has gone on, the two have kept their distance from each other. Bodhi was a stray. He came to the shelter under­weight, malnourished and had missing patches of fur on his ears, legs and chest. We have no idea what his history is; we can only speculate. Maybe he was abused by a man — someone who looks like Jake. Maybe he was chased off by men while on the streets. Maybe he wasn’t properly socialized. We will never know. His fear — mixed with his stubborn I-do-what-I-want attitude — has caused many problems. Within the first month, he snapped at Jake three times, grazing his hand. The first time it happened, we had to have a serious talk. Could we really keep this dog? I saw the stress and tension he was creating in the home, but I couldn’t bear giving up on him. Instead, we took extra precaution. We’ve taken him to obedience classes and even hired a behaviorist who came to our home. I’ve also sought advice from fellow pup parents at the dog park. Looking back, some incidents have been quite comical, though they weren’t at the time. The “little monster,” as I fondly refer to him, chewed a leash in half once while we were sitting on the patio having dinner. He’s broken into his treat bag and gobbled up the peanut butter bites. He holds socks hostage under the bed and steals any article of clothing — clean or dirty— that he can manage to drag away. He’s a tennis ball hoarder and a stuffed animal murderer. What’s mine is his but not the other way around. He loves to roll in a smelly pile of whatever on our walks, and he even peed on my foot once at the dog park. Everyone else thought it was hilarious. Bodhi was recently recognized on the Facebook page Puppy Tales for his naughty behavior. I’m not sure if I should be mortified or simply accept it. But despite all of the bad, and even the ugly, I wouldn’t trade him for any other dog. He’s loyal, fun and attentive. When he’s not being a scaredy-cat, he has a bubbly, playful and mischievous personality. 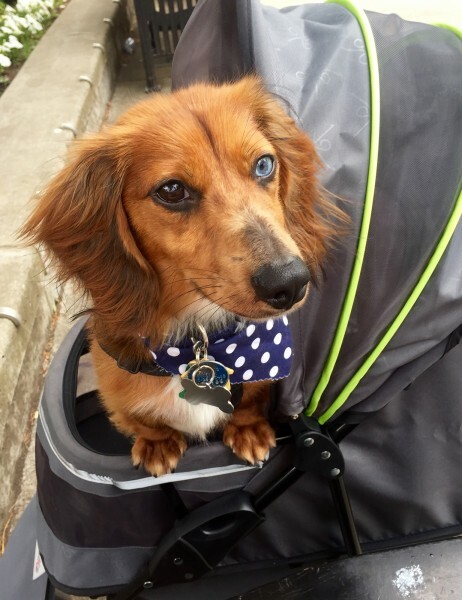 He can often be found rolling around town in his doggie stroller. Yes, he has a stroller, much to Jake’s embarrassment. It saves me the trouble of carrying him around like a football when the little guy gets tired of walking or anxious from crowds. It’s been about two months since we brought Bodhi home; he’s still afraid of Jake. Though, Jake is now able to get a leash on him and take him outside. They even play together at the dog park, cautiously. We’ve seen tiny bits of improvement that we hope will only progress as time goes on. But most importantly, what we are all learning from this experience is an abundance of patience, understanding, trust and unconditional love.